The Japan-American Society of Hawaii launched RAINBOW FOR JAPAN KIDS with the support of the First Hawaiian Bank, Japan Airlines, and Studio RIM Hawaii, and partnering with volunteer organizations from Tohoku, the U.S. Embassy in Japan, and the TOMODACHI Initiative. The program has brought Japanese children directly affected by the March 11, 2011 disaster to Hawaii for rest, recuperation, and physical/psychological relief since July 2011. A major goal of this program is to create lasting friendships with Hawaii’s kids through camp stays and outdoor activities surrounded by Hawaii’s natural beauty. Hawaii has a special, strong relationship with Japan, and is a place where people from different cultures and backgrounds coexist in harmony with wondrous landscapes and natural settings. This program reflects the efforts made by the people of Hawaii to share their “Spirit of Aloha” directly with those who suffered as a result of the disaster. Rainbow for Japan Kids allows participating students to return to Japan with new hope to create a better future for themselves and their communities. The program maintains contact with the children through sponsoring organizations in Tohoku and encourages the participants to continue to correspond with the children in Hawaii whom they met during their stay. Visits have been planned around Japan’s school holidays, keeping the number of participants to about 20-25 each visit, three times per year. Since the program’s inception in July 2011, nearly 100 children have been sent to Hawaii with this program. In its fourth year, the Rainbow for Japan Kids Program will invite 18 junior high school students from the Tohoku region who were affected by the Great East Japan Earthquake in 2011 to Hawaii. 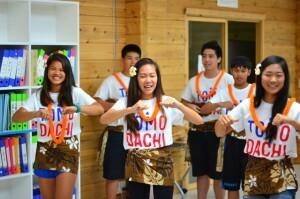 During their stay in Hawaii from July 19-28, 2015, the students will be in touch with Hawaii’s natural beauty and experience the unique multicultural environment and “Aloha Spirit” of the islands. The students will be able to immerse themselves in the local culture through visits to schools and interactions with local students. These interactions will surely allow them to gain teamwork and communication skills necessary for upcoming global leaders. Eight youth from Hawaii ages 13-18 visited northern Japan from July 11-17, 2013 on the Japan-America Society of Hawaii (JASH) Rainbow for Japan Kids project, and reconnected with Japanese kids who visited Hawaii. 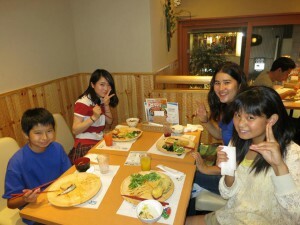 This is the first time JASH sent middle school children from Hawaii to Japan. Over five days, Hawaii’s kids attended a reunion with the Japanese kids at a sports camp near Sendai, visited a school in Onagawa City which sent kids to Hawaii, and engaged in a volunteer activity helping to clear an ocean-side park of weeds and trash to make it useable again. Brock Honda, one of the participants, spoke about his experience, saying, “I just can’t get over how positive the kids I saw were despite all that they have been through. It makes me want to be more positive in everything I do.” Brock’s comments were reflective of those from other participants. The reflective comments and sentiments of the trip’s participants expressed a strong desire to be more caring for others and more confident in their own actions and efforts. Twenty-two Japanese junior high school students aged 12-15 from Iwate, Miyagi, and Fukushima prefectures were selected to participate in the Rainbow for Japan Kids Program 2013 from March 25 for an eight-day stay on Oahu, and the Island of Hawaii. Three of the 22 students were from Onagawa City in Miyagi Prefecture, and were able to participate using funds generously donated by Susie Roos, wife of U.S. Ambassador John Roos, from sales of her cookbook. “I’m now in the 8th grade and have a dream. I want to introduce Japanese traditional cultures to the rest of the world,” said Mei Ito from Onagawa Daiichi Junior High School. After travelling to Hawaii and participating in the Rainbow for Japan Kids 2013 program, she has taken one more step towards reaching that inspired dream.